1) Feeder: Holding up to 3 lbs. 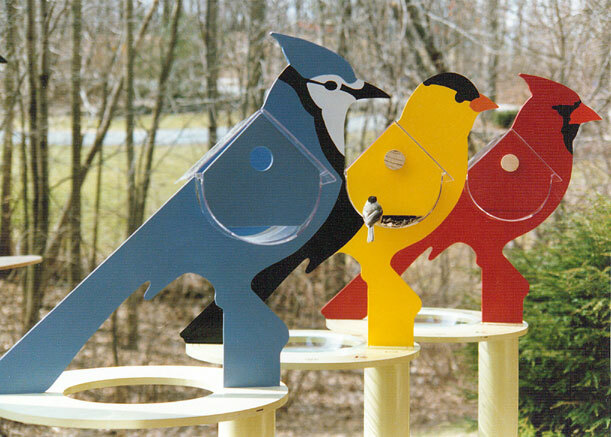 of sunflower seeds in a single filling, the birds can perch two or three at a time on each end. The seed that falls to the lower level is easily eaten by additional birds. We’ve seen as many as a dozen feeding at one time. 2) Bath: By adding a 9” glass PYREX™ pie plate and water, the birds have drinking and bathing facilities. 3) House: By removing the 1 1/2” cork and moving the two seed stops, a house is made for small species, such as wrens, warblers, swallows, titmice, nuthatches, bluebirds, and small woodpeckers. 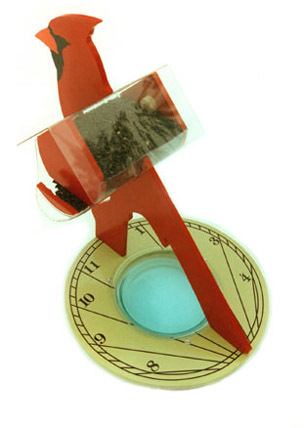 4) Sundial: The base is calibrated for the Northern Hemisphere. 5) Yard ornament: The center adds a dash of color and activity outside a window, in a garden or in a special spot. The construction uses highest quality LEXAN™ (an unbreakable plastic) and MDO exterior plywood, all painted with a water-based enamel. Twelve brass screws hold everything together!